Scientists say an eruption occurred along the middle of Kilauea Volcano’s east rift zone after the Pu’u O’o crater floor collapsed, and lava was seen erupting up to 65 feet high. The Hawaiian Volcano Observatory (HVO) reported that rapid deflation at one of the volcanic crater floors named Pu’u ‘O’o, on Saturday led to the eruption of fissure. At 1:42 p.m. HST this afternoon, USGS Hawaiian Volcano Observatory (HVO) monitoring network detected the onset of rapid deflation at Pu`u `Ō `ō and increased tremor along Kīlauea Volcano’s middle east rift zone. At 2:00 p.m., Kīlauea’s summit also began to deflate. Between 2:16 and 2:21 p.m., the floor of the Pu’u O’o crater began to collapse, and within 10 minutes, incandescent ring fractures opened on the crater floor a few tens of meters away from the crater wall. As the floor continued to drop, lava appeared in the center of the crater floor, the northeast spatter cone within Pu’u O’o collapsed, and an obvious scarp or cliff developed on the west side of the crater floor, with lava cascading over the scarp toward the center of the crater. A new vent with lava shooting as high as 65 feet occurred along the middle of Kilauea’s east rift zone, about 2 miles west of Pu’u O’o. United States Geological Survey of spatter cone of Puʻu ʻŌʻō June 1983. 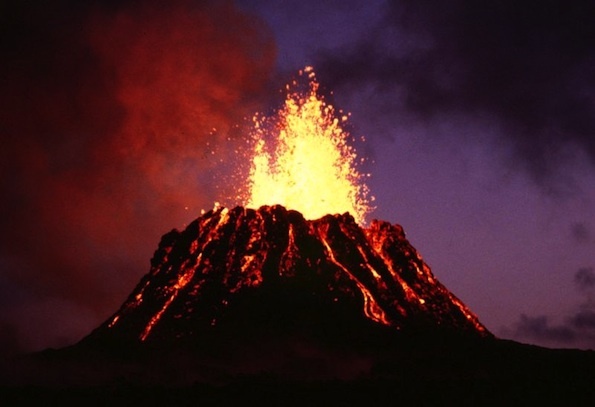 A spatter cone is a formation of molten lava ejected from a vent caused by expanding gases in the lava fountains tear the liquid rock into irregular gobs that fall back to earth, forming a heap around the vent. The spatter cone is the look of a typical volcano peak. Since the 1983 eruption, lava flowing toward the coast has claimed 189 buildings and 8.7 miles of highways, as well as a church, a store, the Wahaʻula Visitor Center, and many ancient Hawaiian sites, including the Wahaʻula heiau. The coastal highway has been closed since 1987, as it has been buried under lava up to 115 ft thick. Hawaii Volcanoes National Park, established in 1916, is a United States National Park located in the U.S. State of Hawaii on the island of Hawaii. The 505.36-square-mile Hawaii Volcanoes National Park encompasses two active volcanoes: Kīlauea, one of the world’s most active volcanoes, and Mauna Loa, the world’s most massive volcano. The park gives scientists insight into the birth of the Hawaiian Islands and ongoing studies into the processes of vulcanism. For visitors, the park offers dramatic volcanic landscapes as well as glimpses of rare flora and fauna.